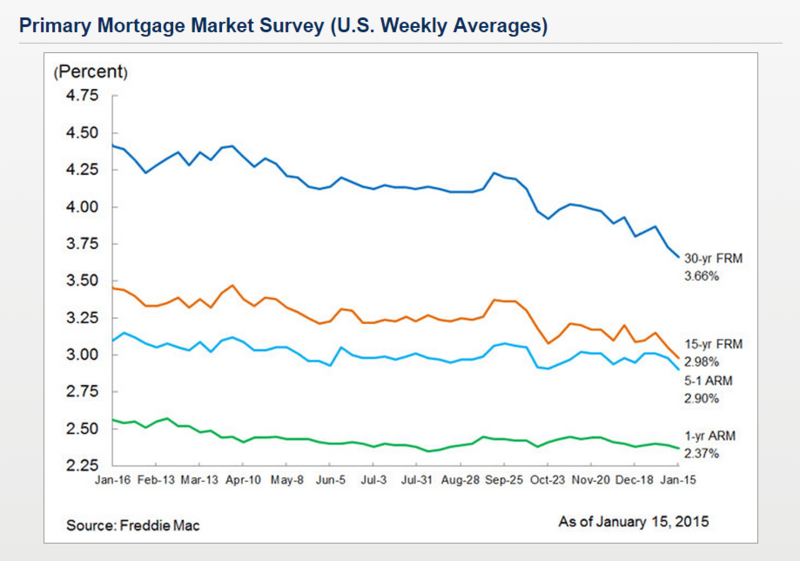 MCLEAN, VA–(Marketwired – Jan 15, 2015) – Freddie Mac (OTCQB: FMCC) today released the results of its Primary Mortgage Market Survey® (PMMS®), showing average fixed mortgage rates falling for the third consecutive week as bond yields continued to drop despite a strong employment report. Averaging 3.66 percent, the 30-year fixed-rate mortgage is at its lowest level since the week ending May 23, 2013 when it averaged 3.59 percent. This also marks the first time the 15-year fixed rate mortgage has fallen below 3 percent since the week ending May 30, 2013. The MBA reported yesterday that applications for refinances are up 66%, the highest levels since July 2013 and purchase applications up 24%. It’s not just the record low rates that are causing this “refi boom”, appreciation in homes in the greater Seattle area are allowing home owners who were once underwater to refi now. Some home owners are also still eligible for a HARP refi which may allow them to skip the appraisal. This is a great opportunity for home owners to reduce their monthly mortgage payment and/or get rid of monthly mortgage insurance (pmi). We are also seeing people who had a short sale or foreclosure three years ago becoming home owners again as FHA only has a 3 year wait period following a distressed sale. I highly recommend that folks who had a distressed sale start the preapproval process well before their wait period is over. If you are considering refinancing your mortgage or buying a home located anywhere in Washington state, where I’m licensed, I am happy to help you. Click here if you would like me to provide you with a mortgage rate quote.